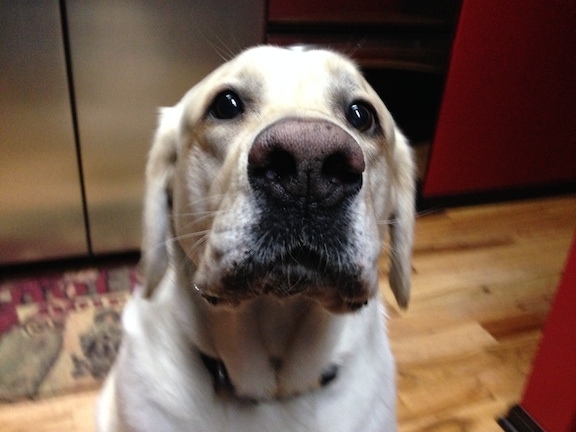 Tank is a five-year-old yellow Lab who was getting possessive and protective of owner to strangers outside their home. Anytime you have a dog that is showing signs of possessiveness, its cause for concern. When your dog weighs over 100 lbs, it can be a downright dangerous situation. When I arrived for the session I made a point of adopting a non-confrontational body language, avoided eye contact, big or sudden movements and showed no interest in interacting with Tank. These are all communications that can trigger a response in an aggressive or dominant animal. Fortunately Tank’s aggression was on the mild side and only comes into effect when meeting new people outside of his home. When I sat down to discuss the situation with my clients, Tank came over and invaded my personal space to give me a good sniff. I allowed this at first, but when he started to get over excited about the contents of my bag, I stood up and faced Tank to disagree with his violation of my personal space. To a dog, standing upright is the most commanding position a human can take. When you stand and face a dog this way you project authority so most dogs will turn away, back up or stop when you abruptly stand up and face them. I explained this authoritative positioning to my clients and we all started to stand up and face Tank any time he got too close. I also went over the series of escalating consequences I like to use to communicate to a dog that I disagree with an action or behavior. The next of my series of escalating consequences is to stand and face the dog as I mentioned earlier. If that doesn’t work, my next step is to march directly at the dog so that it moves away to avoid you running into or over it. You have to move with purpose and no signs of hesitation when you use this consequence. By making the dog move away from you, you are taking the position and because you make the dog move away, you put it into a subordinate or follower position. Anytime a dog tries to control a person or situation, its a good bet the dog sees itself as a leader, protector or that its job is to defend people, places or things. Whenever I work with a dog like this, one of my goals is to help the dog see and identify its owners as an authority figure. To accomplish this, I suggested his owners adopt a few new rules and boundaries. Not being able to sit at the same level as its humans (no furniture) helps the dog see the difference in authority between humans and dog. Making the dog do something before getting attention or affection and waiting for permission to eat food in its bowl are small but effective forms of structure that help to redefine the leader follower relationship. I also went over an exercise to help Tank look to them for guidance and permission. Because he is a smart dog, it only took Tank a handful of repetitions before he mastered the exercise so I showed them how to make the exercise more challenging. By practicing this exercise a few times a day for the next few weeks, Tank will adopt a new way of dealing with situations he is not prepared for. With time, this will enable Tank to restrain himself instead of reacting without thinking. Tank is far from an aggressive dog. He was just under the impression that he needed to defend his humans to people he didn’t know. Its imperative that his owners change Tank’s perception of being in leadership position in order to eliminate the possessive behavior. Once he starts to see himself as a follower, his owners will be able to disagree with unwanted behaviors like possessiveness or snapping at people he doesn’t know.